If you can find the site of the old hall of Forseti, Glitnir, you are near the doorway to this realm. 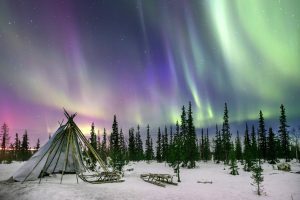 It is a wild world, with passive volcanism, lush growth, stark highlands, long summer days and long winter nights, and the auroras nearly every night in grand splendor. It lies oriented towards Vanaheim, the land of molten rock and volcanism, and somewhat towards Muspelheim, the land of forest and greenery. 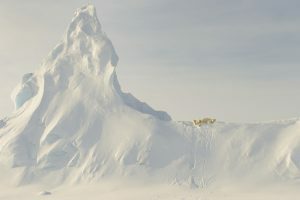 It seems to be a much fairer land than the snowy near artic climate that seems prevalent near the old hall. Tales of strange animals, odd plants, people, and warm to tropical climate crops. One enters through this area, and must traverse to the warmer regions below. The foothills roll gently, and host a wide range of trees, shrubs, and surface growth. A ridge valley bisects the main land from central west to the central north, and fissure volcanos ooze pahoehoe lava. The entire land has lots of geothermal activity. 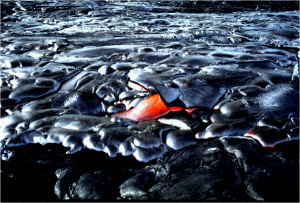 Few venture into the lava regions as it can be very dangerous. the land does widen though, and small frequent earthquakes are the norm along this area. Dark basalt and occasionally a bit of good sheen obsidian is found here, so it is occasionally visited by the needy and the brave. Overall the land is very lushly green and verdant, rarely seeing frost in the lower regions and snow in the highlands. Resources, they seem metal poor, but various items of bone, wood, stone, and glass have been showing up at markets in mainstream areas (such has Hrafnborg) as well as some rare and exotic warm crop foods. 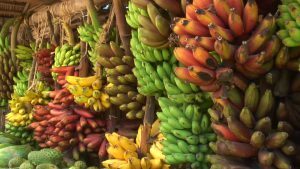 Tasty and exotic, there has been a good market for the foodstuffs. Furs of reddish and tan and cream, maybe large goat sized but very plush soft fur, have also come out of the area. What the hides come from, no one is saying. The fur is especially desireable as boot and slipper lining, as well as hood lining. 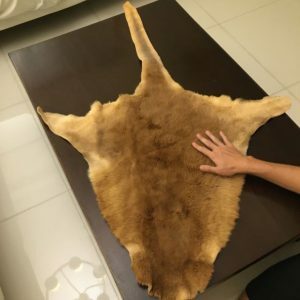 The pelt shown is average size for the ones brought to market. When asked, the merchants just sort of avert gaze and go ‘they traded for these from others’ and have no idea what they came from, or where, other than ‘far far inland and up the river’ for the location. About twenty bundles have been seen at once, with ten pelts in a bundle, so two hundred. Most of the time it is forty to fifty that show. The pelt shown is one of the tan ones, the reddish can get quite ruddy, and the cream often have a grey tint to them, very rarely does a true cream one show. Snow white are rumored, but none have made market in Hrafnborg , yet. Making a western style coat will take about seven pelts. A good full cloak, ten to twelve especially with a hood. Lining a man’s floor length robe is about eight to ten depending on size. Slippers two, a warm hat or gloves, one. 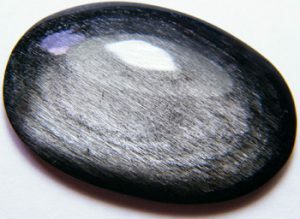 Sheen obsidian, usually worked into small cutting blades (such as for scalpels) or decorative cabochons up to a few fingers across in silver, blue, green, purple and an occasional orangish gold, have also surfaced. The cutting blades are almost always black translucent with poor sheen, but keenly sharp edges. 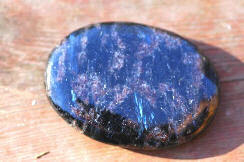 <Rare Electric Blue Sheen A few samples of the various obsidians coming out of the region. A few belt pouch size bagfuls of fine grade specimens have shown up in the market at Hrafnborg and been quickly snapped up. The supply is very irregular and infrequent, and often mixed colors instead of one color/type. 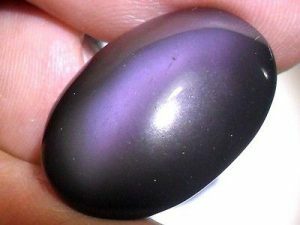 The minerals (volcanic glass to be exact) don’t show magical properties per se, but can be worked by magical means. The biggest chunks seen have topped out at about twenty carats, a lot are in the few carat size. 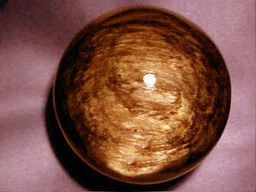 Most are cabochon shaped, a few other shapes and one orange-gold small sphere has been seen (about nineteen carats, fairly small). No obelisks, facetted shapes, or wand points. 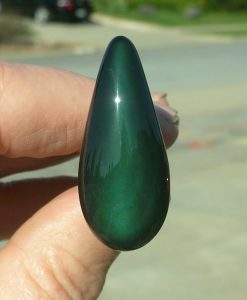 The Green Sheen pictured is a flat teardrop not a point for something such as a wand. Malcolm has been seen as the one trading them, and he usually will trade for metal of almost any form in return. Especially precious and semiprecious non ferrous metals of any sorts. 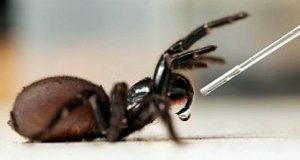 Bars, ingots, coin, or thick wire are his preferences. Some copper, tin, and brass as well. 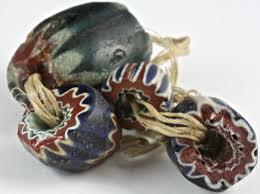 It is bet the deposits have been barely scratched, if the quality of the material seen has any indication. When cornered Malcolm has been very vague about where, or how much, might be out there. So the price has remained good in the Hrafnborg markets for these items. It is noted that only Malcolm shows up to trade these, and no one else. He never shows with obsidian if the merchant vessel is in, only separately. 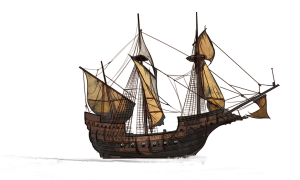 There is a strange caravan ship, carrack style, of maybe 1500’s vintage, with orangish red sails that docks at Hrafnborg on occasion and offloads the food items. The people are small and sturdy with olivey complexion tones, and blondish to ginger to a light brown hair color. Eye colors are a muted blue or green, hazel, a light golden brown (quite common) and a pale grey (next most common). They have a light lisp to their accent but are fluent in the dominant tongue of Asgard, and can whisper and click in a strange sort of language as well, they rarely do so in port. Their port of call on the Bylgjakappi (Wave Warrior), as the ship proclaims on her stern, is a place called Höfn Bæjarins or ‘Port Town’. A tall black haired man is often seen on the ship, standing head and shoulders above the sailors manning her. 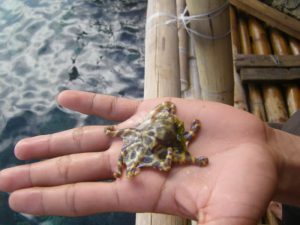 He tends to stay below decks when the ship docks and while the ship is docked. Port Town. What little that has been said is that is a natural harbor and a sea port. 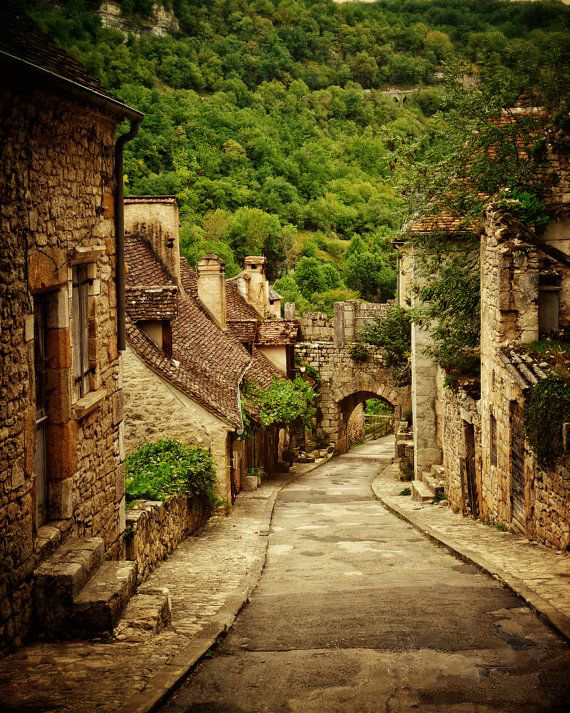 The buildings and streets are stone, the roofs tiled, to help prevent fires. This view is rumored to be south, off the merchant hill heading downwards to the dockyards and port to the right or west in this picture. The bridge like item is actually an aqueduct, covered, that brings water from up-watershed down to the city. This keeps possibly contaminated ground water from being used. Housing has running water and flush plumbing. On the heights below the ridge, live the nobles and aristocracy, at their ‘feet’ is the merchants and craftsmen, with large open air markets. Below that are the lower classes until you get to the docks and the harbor. There is also rumor of a beach at this place, made of dark sands. Port Town is said to have about forty percent of the population, and has about eighty to eighty five thousand people there. An active fishing economy plus trade with other places and about half of the other settlements are best reached by water as of yet. A good portion of the remainder of the population is rumored to be coastal or not far away on a few of the rivers that wend their way to the ocean. Technology levels appear to be pre-renaissance, between 11th and end of 16th century. They seem to know a bit of Rune Magic, and the lights aboard the ship are all done magically, it lowers the fire hazard. Money, they have that and barter, plus hacksilver. What their coinage or other looks like no one knows. Those on the ship have precious metal chain or use hacksilver when they visit Hrafnborg. They come with silver if they have something metal. 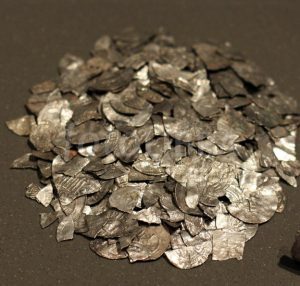 Metal seems very rare there, and they are more likely to barter goods for goods, especially metal items and metal to be worked, instead of giving up something like precious metal to buy something. Nails, blades of any sorts-especially knives-not daggers and swords, wire, and cooking pots seem to be very popular items to acquire. As well as scissors, and pins. Lots of pins. 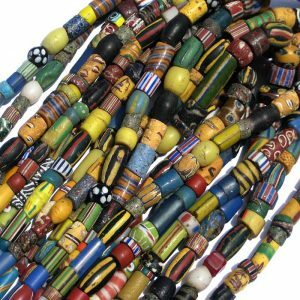 That being said, a lot have exquisite glass beads to trade if they need to buy something before they trade at the marketplace. The ship tends to show the day of the full moon and leave the day after, no exceptions. 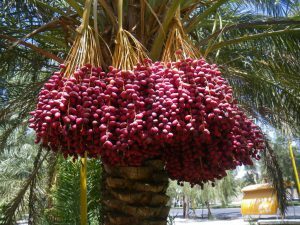 Ship rations seems to be dried fruits, nuts, something akin to wild rice, various root vegetables that are boiled or roasted, fish, occasionally goat or mutton, and rarely, fowl. Ashore beef tends to be a very popular dish. A whole roast ox is often purchased from one of the large inns, and taken aboard still on the spit, which is returned shortly afterwards. The ship crew does NOT drink alcohol when ashore. The number of those aboard that do come ashore is limited, mostly a few merchant types, a few guards, and a few stevadores which are there to actually move the freight around. The land is said to be geothermally active and a lot do use that heat for a lot of things, including heating homes, generating flywheel power to run sawmills and the like, and to grind grains. Digging a pit for an in ground hot tub is apparently quite common. Those that venture into Forsetiheim usually are not heard from again. Jesbys have been known to try to sneak in or get someone to do so for them, and so far none have been successful in coming back out… the only one successful at returning so far, seems to be Malcolm. He also doesn’t seem to be taking anyone in. It seems that Malcolm Forseti recently appeared at Lambeth, and spoke to PM Hillary and Minister of Commerce Cleopatra, about opening trade relations between Lambeth and Forsetiheim. 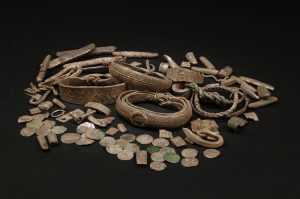 Most of the goods seen at Hrafnborg except the obsidian, were offered in exchange for things like clean technology to advance the level in Forsetiheim, and goods such as raw fairly common metals. Items move via the Antilla Railway, though that takes a little maneuvering at the Asgardian end. Some trade papers were signed, nothing that would go against Asgard’s stance in any circumstance. There is no alliance, just an opening of trade.